Discover how to shift to a competency-based education system that replaces traditional, ineffective practices with a new model that fosters personalized, student-centered learning. This learner-centered approach will help you assess performance to ensure learning for all students. Shifting to a competency-based curriculum allows educators to revolutionize education by replacing traditional, ineffective systems with a personalized, learner-centered approach. Throughout the book, the authors explore how the components of professional learning communities (PLCs) promote the principles of competency-based education and share real-world examples from practitioners who have made the transition to learner-centered teaching. Each chapter ends with reflection questions readers can answer to apply their own learning progression. Evaluate the qualities of true competency-based schools and the flaws in traditional schooling. Consider the foundational role that PLCs have in establishing a competency-based approach and promoting learning for all. Gain tips for successfully implementing student-centered practices for learning competencies and performance assessment and grading. Explore real school experiences that highlight the processes and challenges involved in moving from traditional to competency-based school structures. Access reproducible school-design rubrics appropriate for the five design principles of competency-based learning. 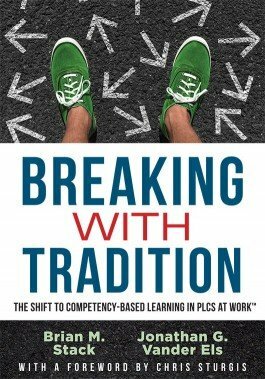 New book by my friend & NH Principal of the Year @bstackbu and @jvanderels on #competencyed published by @SolutionTree. Written for principals, by principals.